30 mm 18K pink gold case set with brilliant cut diamonds, 18K pink gold crown with a cabochon cut pink rubellite, natural acetate dial set with diamond indexes, quartz movement with hour minute functions, 18K pink gold ardillon buckle. 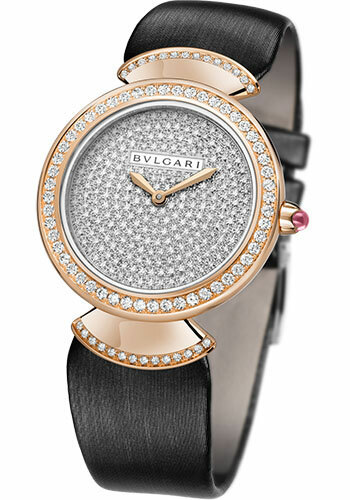 30 mm 18K pink gold case set with brilliant cut diamonds, gold crown with a cabochon cut pink rubellite, natural acetate dial set with diamond indexes, B046 quartz movement with hour minute functions, 18K pink gold ardillon buckle. Water resistant to 30 m.